The four outside facades are characterised by the simplicity of their design, and present an homogenous structure which is repeated in all fronts with little variation in the arrangement of the spans. The sobriety of the architectural language is apparent in the use of flat mouldings at the base and at the corner posts of all fours fronts of the prismatic section. The windows with their corresponding windowsills maark the staircase on the different faces, in some cases using the primitive spans of the inner core. They were standardised to make them symmetrical, and this meant that it was necessary to alternate open spans with with blind or false spans. One of the most peculiar features of this lighthouse is the helicoidal impost on the outside walls. It goes from the base up to the top of the prismatic section and evokes the ascending ramp which in Roman times gave access to the Tower. Traces of this ramp survived on the walls of the building and were found when in 1789 the restoration by military engineer Eustaquio Giannini began. This moulding conditions the distribution of the spans which will be of five pairs of windows on the east and west facades and four pairs of windows on the north and west walls. The remains of the Roman lighthouse are beneath these four walls built in the 18th century. 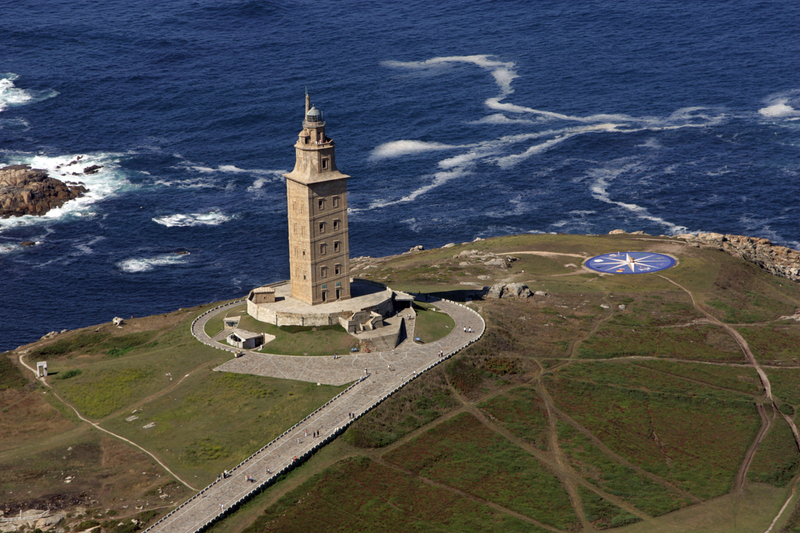 This lighthouse was probably designed by architect Caio Sevio Lupo, who hailed from Lusitania. He left at the foot of the Tower a commemorative epigraph which has fortunately survived under the protection of a small aedicule which was build in early 19th century and located on the platform that is the base of the monument. It is a very unusual fact that the name of this architect has reached us, of whom we know nothing else. 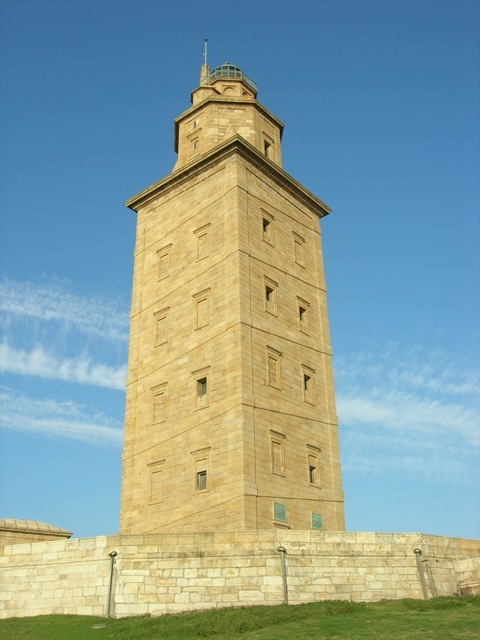 But he must have had some direct association to the monument itself because an engraving of the Tower of late 17th century that is kept at the Archive of the Cathedral of Santiago, shows the lighthouse and the inscription at the foot of it. This seems to prove that for the people of the time both testimonies were part of the same reality. which translates as, “Consecrated to Mars Augusto. Caio Sevio Lupo, architect of Aeminium (Coimbra) Lusitano in the fulfilment of a vow”. Of the Roman construction, the inner core of the lighthouse has survived while the outside access ramp has been lost. This inner core is a square building, each side of it measuring 11.75 m, i.e. 33 Roman feet. Of the helicoidal ramp and the outer wall, the only remaining evidences are those that were found at the archaeological excavations of 1992. 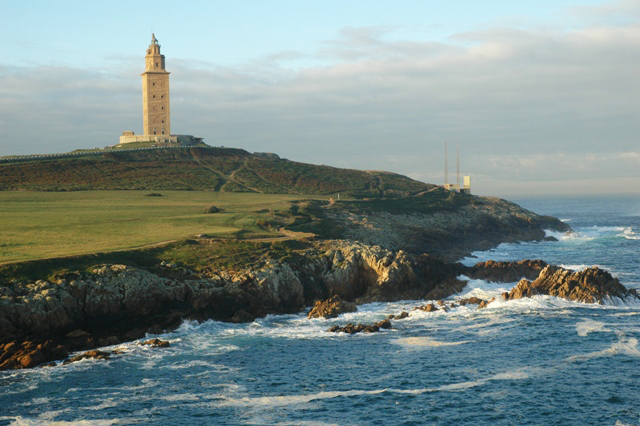 According to the data provided by Caballero Zoreda and Latorre González-Moro, the construction was founded on a platform of great ashlars levelled on an upper step cut onto a rocky hill. Of all this system of foundations, the scar of the platform has survived, where the mark of alignments is still visible. As far as height is concerned, 37.58 m. of the Roman building survived. Of them, 34.38 are hidden by the Neoclassical cover and the remaining 3.20 m are under the platform that was built in early 19th century and are easily visible from the excavation area. To this structure, we should add the capping section where there was the Roman rotunda which, according to 18th century documents, had a diameter of eight vara (approx. 6.40m) and was 5 varas (4 m) high. This would mean that the original height of the Tower would be some 41.58 m. These dimensions would make this lighthouse one of the highest surviving building of Roman times only behind Pont du Gard (France) of 49 m and the Trajan Column (Rome, Italy) of 38 m, but ahead of the Column of Marcus Aurelius (Rome, Italy) of 30 m., the Aqueduct of Segovia (Spain) of 28.5 m and the Aqueduct of Les Ferreres (Tarragona, España) de 27 m.
As we have seen, the Tower of Hercules currently measures 55 metres, of which 34 m correspond to the Roman building and 21 to the refurbishment of 1789 by military architect Eustaquio Giannini aimed at providing the old lighthouse with a new lantern, to which in 1806 the beacon was added. 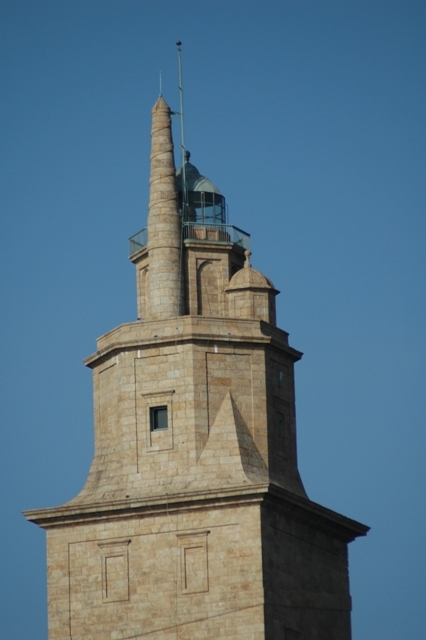 These measurements make the Tower the only Roman lighthouse where an important part of its original structure survives, albeit hidden under a neoclassical cover.